When looking to complete a design or remodel residential homes, one very important detail that needs consideration is the threshold. Thresholds provide valuable protection to foot traffic, doorframes, and other elements in a home. While thresholds provide protection, they can also add a great sense of style. 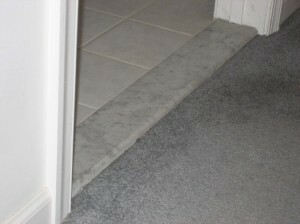 One type of threshold that provides a lot of style is marble thresholds. Marble thresholds are very popular due to the durability and natural and neutral style they can add to any room in a home. When you are shopping for marble thresholds, you will find that there are many options to choose from. There are three things to consider when you are choosing marble thresholds for your homes. These stone colors are often preferred by developers and contractors due to the overall natural color and tone that helps them to blend in with a variety of interior designs. Ultimately, the color thresholds you choose should be based on the style of the home. Ideally, the color and design scheme should be consistent throughout the home and should also match up with the window sills you choose. One of the main advantages of having a marble threshold installed in a home is that it can provide valuable protection to foot traffic due to beveled edges. When choosing thresholds, you will be able to choose between single or double-sided beveled edges. Overall, the types of bevels that you choose will be dependent on where the door is located. If the door is located in the middle of a home and acts as a room separator, you will want to have two beveled edges. However, if it is located on the side of the home and provides an exterior entrance, you will want just one beveled side. When you want to have marble thresholds installed in your home, the dimensions of the thresholds also need to be carefully considered. The most common dimensions of a bevel today are 2 x 36 inches, and it aligns with the standard doorframe. However, builders who are looking to design a home with larger doorframes will need to find a threshold dimension that matches the correct door size. Thresholds are commonly available in 48 and 60-inch widths as well. It is also possible to order custom-designed thresholds to match your doors. If you are interested in learning more or buying marble thresholds for your project, you should contact Stonexchange. Stonexchange is a leading provider of natural stone thresholds and window sills to developers, contractors, architects, and wholesale buyers. We are conveniently located at 9605 NW 13th Street in Miami, FL. Call us today at 305-731-2400 to place your order or visiting the company website to contact the company directly.